My father died two days and three years ago, just one month shy of his 98th birthday. He was a paratrooper in WWII and had his woodworking shops in somewhat dangerous neighborhoods in the greater NY area. He always carried a switch blade and was afraid of nothing, although I must say, he was dismayed to learn that people were actually paying good money to parachute out of airplanes. 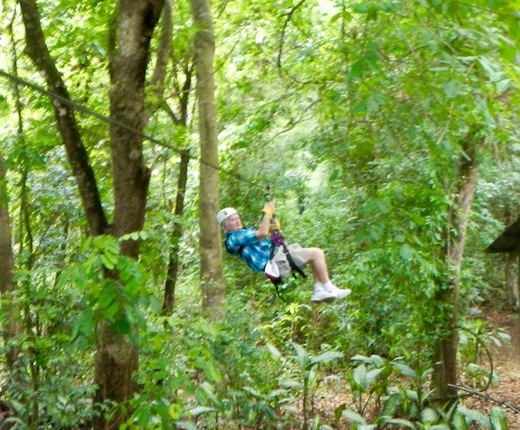 I recently received this inspiring photo of my dad's first cousin Herbert ziplining in Costa Rica. He is 90 years old and clearly has the same genes! I'm not sure, however, if I do. When I was very young, my father gave me the little silk parachute he had used in the war and I tried jumping off the bureau. Though I didn't break or sprain anything, it seems to have cured me from any desire to jump off anything higher than a low diving board!